“I believe the structure of compensation is flawed,” said Representative Barney Frank, Democrat of Massachusetts, center. Less than a day after the Obama administration announced a plan to set executive pay levels at bailed-out companies like Citigroup and Bank of America, a spat broke out among members of a House committee on Thursday about the regulation of corporate compensation. The ideological clash came at a hearing before the House Financial Services Committee during which lawmakers debated whether executive pay should be curbed at all companies, not just those receiving federal money. The topic sent the committee’s Republican members into an uproar, with several balking at the idea of the government setting rules that would interfere with the internal affairs of companies. 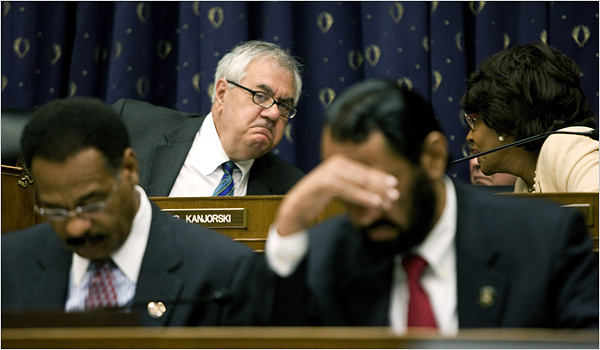 Barney Frank of Massachusetts, the chairman of the committee, disagreed, saying it needed to come up with a bill that would alter the structure of executive pay before the Congressional summer recess. Lucian A. Bebchuk, a Harvard law professor who testified at the hearing, had similar criticisms about the banking industry in particular. Many Republicans on the committee expressed concern that the administration was using the financial crisis to extend its grasp over the private sector. While they generally said they approved setting compensation limits on those companies that took money under the Troubled Asset Relief Program, they stopped short of supporting legislation that would broadly change corporate governance practices. Officials from the Treasury Department and the Federal Reserve were on hand Thursday to describe the Obama administration’s stance, reiterating Treasury Secretary Timothy F. Geithner’s statements from Wednesday on executive compensation. The recommendations were focused on increasing the power and independence of corporate compensation committees and giving shareholders a nonbinding vote on executive pay, through what are known as “say on pay” provisions. Although Wall Street may be the focus of the pay debate right now, he suggested that the problem was much wider. “While the financial sector has been at the center of this issue, we believe that compensation practices must be better aligned with long-term value and prudent risk management at all firms, and not just for the financial services industry,” Mr. Sperling said. A version of this article appeared in print on June 12, 2009, on page B4 of the New York edition.